Ireland Women’s head coach Aaron Hamilton was in a reflective mood following the loss to Pakistan but remained upbeat about his sides journey through the World T20 tournament so far. He called for his squad to relax and focus on enjoying their cricket and the whole ‘tournament experience’ ahead of their third Group Stage match against India tomorrow. The squad had a quieter day, with gym sessions, team meetings and physio sessions on the agenda. Speaking from the team hotel in Georgetown, Hamilton said: “Yesterday’s game was in all honesty a missed opportunity for us. “Probably the biggest issue for us was dot balls - we didn’t display enough ability in turning over the strike and keeping the board ticking over. “With the ball we were really good with the powerplay, but we just didn’t capitalise on it. Coming out of it there were probably three overs where we conceded 12 or 13 runs an over. But we finished bowling out our overs well. “I thought with the bat Isobel Joyce was very good, she started slowly but made up her runs as she went. And once again Shillers (Clare Shillington) played well out front. “However, as a batting unit we probably just needed to play straighter for longer - most of our dismissals were going across the ball. “Our fielding was quite good. We put down a couple of harder chances - Shauna Kavanagh had a spectacular effort, and if it had stuck, it would’ve been fantastic. “Going into the last two games we’ll be working on improving our scoring shot percentage, to rotate strike. “The team just need to relax and have some fun, to believe in themselves and believe they deserve to be here. We also need to extend our good patches for longer. Pace bowler Lucy O’Reilly has been receiving some high praise for her performances in the tournament. The 19-year-old spoke about how she has brought previous tournament experience to this event: “I think the experiences of playing at two previous world cups have helped me adjust with nerves. Playing in a tournament like this is a huge step up compared to any international, to be honest. Nerves can be a huge factor that can affect players, but luckily I’ve been able to channel them this tournament,” she said at the team hotel following a gym session. 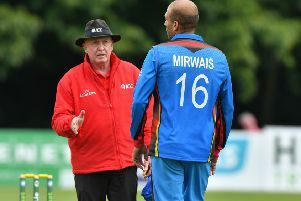 In response to veteran commentator Alan Wilkins’ praise of O’Reilly’s performances and technique, she said: “I’m absolutely flattered to receive the comments I did from Alan Wilkins, and I’m feeling quite confident after the Pakistan game. O’Reilly had, In spite of her modest assessment, a very good home season and was Ireland’s leading wicket-taker at the World T20 Qualifier. She was also chosen to be part of the inaugural ICC Women’s Global Development Squad in July. The clash between Ireland (world ranked 10th) and India (world ranked 5th) is set to be the first time these two sides have met in the T20 format. Their 12 previous encounters – all won by India – were in the one-day format of the game. The final group game is against New Zealand.